Wouldn't you know it... the one panel that was actually on-time, was the one panel I was late to. I got there 5 minutes after 10am, so missed most of David's introduction. This started becomming a habit for me, as each one I was early for started late, and each one I was late to, started on-time. 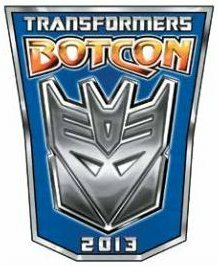 So if you ever plan to be at a BotCon while I'm there, make sure I'm late to the panels if you want them to start on time. David was also talking about his role as Beast Wars Depth Charge as well, while Steve Blum was in the audience heckling the pair with the voice of TFPrime Starscream. 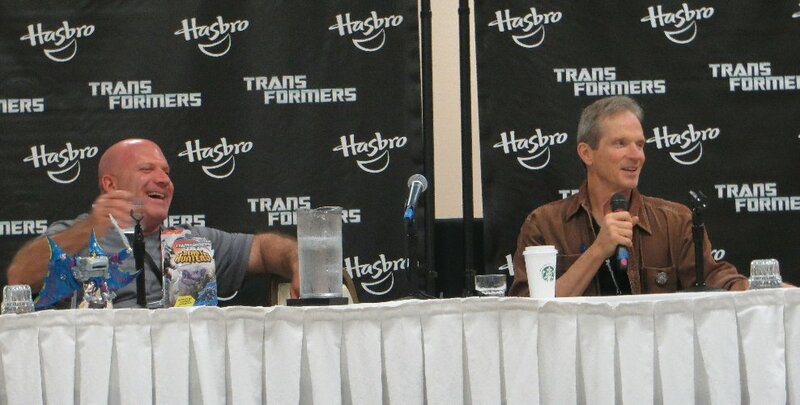 Not sure why Steve Blum wasn't up on stage for this panel as well, since he was also a TFPrime Voice Actor. The last bit of David's bio that I caught - had voiced a Klingon in Star Trek Into Darkness, and played the Gorn in the Enterprise flashback of the classic Original Series episode. James' bio - spent 19 years in the industry, with a mostly Theatre background. Did some Soap roles, then 5 roles in Star Trek, and the Highlander series. Then recently got into Voice Acting, with Starship Troopers first, and Transformers Prime is the second Animated/Voice role. That was about it, before the Q & A. Commented on Frank Welker being a non-stop comedian at recording sessions. James - had no idea of the Gen1 version, so just thought the character should sound tough and cocky, a bit like Clint Eastwood. David - believes that it is best to ignore anything previous, so as to create something unique & original. Said his audition was phoned in at 1am from his home studio "half clothed". Had high regard for Sue Blu as a Voice Director. David - similar to Scott McNeil, he was told on the day of recording his final lines that Depth Charge would die. They each now have toys of their characters - you can see some of David's newest ones in the photos at this panel. James - the Movie was recasting the voice of Megatron in the second one (or third one), and he was one who was invited to audition (maybe as a back-up for Hugo Weaving). Obviously it wasn't required. David - voiced the character Brawl in the first Movie game, and auditioned for the role of Megatron on the DS game. James - game voices and some commercials. David - a voice role in the 2014 Marvel Universe movie "Galactic Guardians".